Prior to college, I hated reading. And though I learned to appreciate its merits in college, there were times I was tempted to take a short cut. All students know where reading short cuts lay. 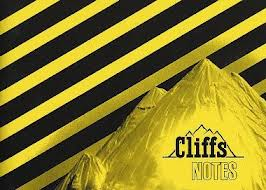 In little books called Cliff Notes. During my college days, you couldn’t find them on the internet, but you could in book stores. I never felt good about using them until I began reading some of the classic shorts stories in literature class. I failed to comprehend how the professor knew what particular symbols stood for. How was I supposed to learn this material if I couldn’t understand it? So on occasion, I chose the short cut. God’s principles are tough. Loving everyone regardless of whether they love me isn’t easy. Some people are simply difficult to love. Controlling my anger—especially when someone or circumstances have given me reason to be angry, is demanding. Not overeating and eating healthy is also challenging. And giving when I don’t have extra to give always tests my faith. But obeying these and other principles leads to a higher spiritual plane where I can walk in the high places with God. Diligence is required as well as is determination. Day in and day out, I must be consistent whether I feel like it or not. My success is guaranteed by the power of God’s Spirit residing in me. Apart from him, I can do nothing. Have you been attempting spiritual shortcuts in hopes of reaching spiritual growth? Let God give you the strength to take the long way around. Prayer: In Your power, Father, we march onward with strength and peace toward our ultimate goal of spiritual growth.